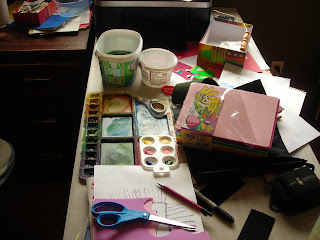 my painting stuff fits my desk the way it fits my life - squeezed in where I can find a space! for your audience's sake, title and date your paintings! what is art's role in our national identity? does it play a part in defining who we are? what is the role of our large public galleries? how should they interact with the public?